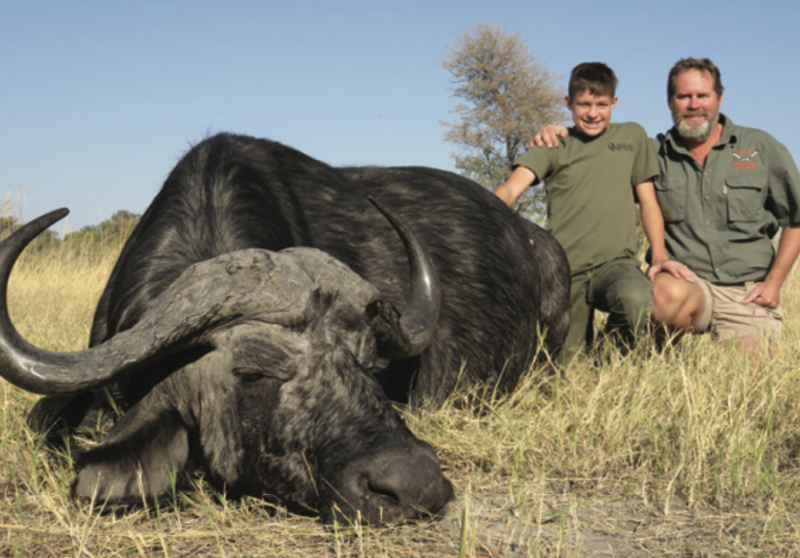 For any trophy hunter, the Cape buffalo can be the most exciting of the dangerous species to track and take down. It is unpredictable and particularly dangerous when wounded, extremely good at concealing itself and difficult to stop at close range when it launches a head-on charge. Following in the footsteps of his legendary grandfather, Fred Bartlett, professional hunter Mike Kibble shot his first buffalo at the age of 13 and has had numerous encounters with buffalo since then. Mike takes up the story of a memorable buffalo hunt with Dale Payne in a concession along the Kwando River in the Zambezi Region, an area that became famous as the Caprivi Strip. 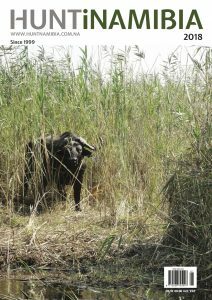 “Dagga boys”, the old bulls that have been forced out of the herds by younger ones, are typically found on ‘islands’ separated by numerous channels. When I say islands, it is more like higher ground formed by termite mounds and covered in beautiful big trees. You can see these areas were swamps in earlier days when the Kwando River flooded, but as the water receded with droughts over the years, these ‘islands’ remained. Our hunt took us way off the beaten track and we had to use kayaks and mokoros (dugout canoes) as we made our way into unexplored territory through dense stands of reeds lining the channels. The water on the Kwando system is gin-clear and we could see every leaf on the bottom and every fish swimming by. It was really beautiful and peaceful. We had some really hairy experiences before we managed to find an old buffalo. Paddling silently down the channels we had the occasional hippo that would come running below us, creating a bow wave or two passing – not very pleasant. Going down an eyrie channel the client asked whether there might be some crocodiles around and I said, ‘Well, you know if you keep your eyes open you occasionally see them lying on the bottom as you paddle over them’. As I spoke, we spotted a crocodile longer than the mokoro lying just a few feet away on the sandy bottom of the channel. It was a rather frightening experience but for Dale, it was a great story to tell back home. On one or two occasions we had to cross channels on foot as it was too far to carry the kayaks. We had to lift the rifles and kit above our heads as we waded through water reaching up to just under our armpits. We had the occasional bit of dung from elephants that had crossed the channel, water lilies and everything else floating under our raised arms. In those areas, I always tell my clients to bring a pair of hunting boots. So you hunt in your sandals. You would have two or three pairs of those and you are in and out of boats and dugouts and onto islands. After exploring several islands we came across three old buffalo bulls, including one that was extremely attractive. He had a very nice drop in his horn and a wide and impressive boss… very handsome. The trouble for us was that we had to go through a swamp, and trying to be inaudible in water and mud is not very easy. When you get caught up in dense stands of reeds, lilies and other stuff and then bump into a hippo basking in the sun only four or five feet away from you, it is quite scary. And when the hippo suddenly takes off, it alarms the buffalo and the opportunity is gone. When we finally reached the island, two of the buffalo had left. It is easy to distinguish one old bull from the other and I always take careful note of the form of the head, the shape of the boss, the curl of the horns, patches of mud and where they have hair on their bodies. Therefore I knew that none of the remaining bulls were the one we were after. With the sun beating down on us, we continued tracking until we found him feeding. I come from the old school of hunting. In my experience you walk it, stalk it and put up the sticks – a tripod used to rest the rifle on. I always try to minimise situations that could cause trouble and end up going wrong for you and the client. I get the client as close as possible. We put up the sticks and Dale placed a fantastic shot. It was a one-shot deal. 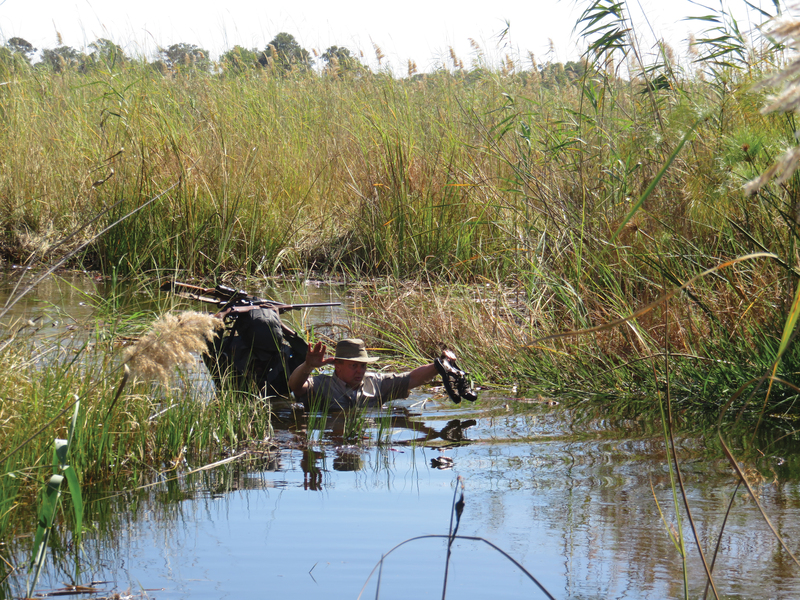 It was an amazing hunt that gave Dale an experience second to none – wading through water up to our armpits, gliding silently along on lily-clad channels where crocodiles and hippos lurk, appreciating the unspoilt surroundings and testing his tracking abilities. He had never experienced such a hunt before. Adventure, hunting, nature conservation and a love for the African bush run deep in the lineage of this family. Born in Nairobi in 1923, Fred Bartlett – in the picture above left with Alberto Bailleres – grew up on a farm in Kenya. He joined the army during WWII, and then Kenya’s Game Department as a Game Control Officer responsible for the Mount Kenya area and the northern Aberdare Range in 1949. In 1957 he became a professional hunter, a profession which took him to Botswana, Kenya, Tanzania, South Africa and Namibia. After an eventful and adventurous life, Fred Bartlett, who can justly be described as one the great hunters in Africa passed away in Kasane, Botswana, in April 2012. The second generation hunter, Pete Kibble, was born in Kenya in 1945. He learnt the old school ethics of hunting at an early age under the watchful eye of many great hunters of the time, including his future father-in-law. At the age of 17, he was already hunting buffalo, elephant and leopard. He married Liz, Fred’s daughter, in 1967 and later moved to Namibia where he still runs his own safari outfit with his wife. Pete’s three sons are all qualified PH’s and photographic and fishing guides. 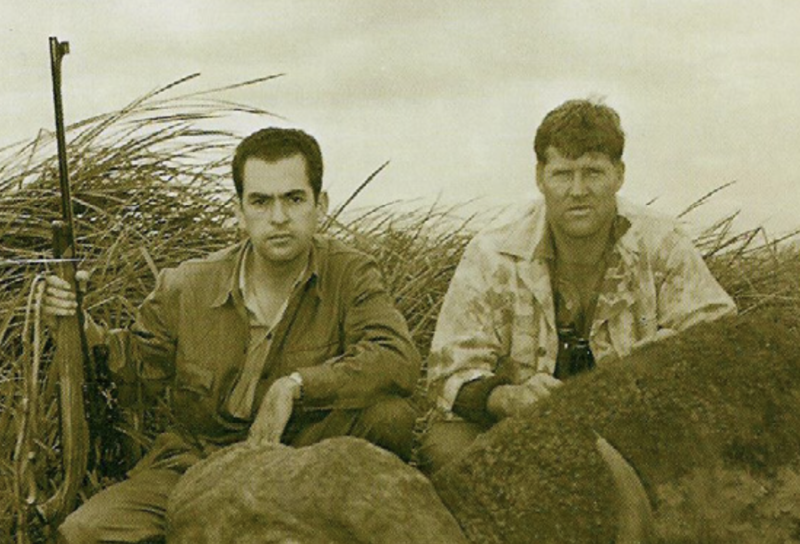 Mike, the oldest (with him on the photograph), the third generation of professional hunters, was born at Victoria Falls, Zimbabwe. 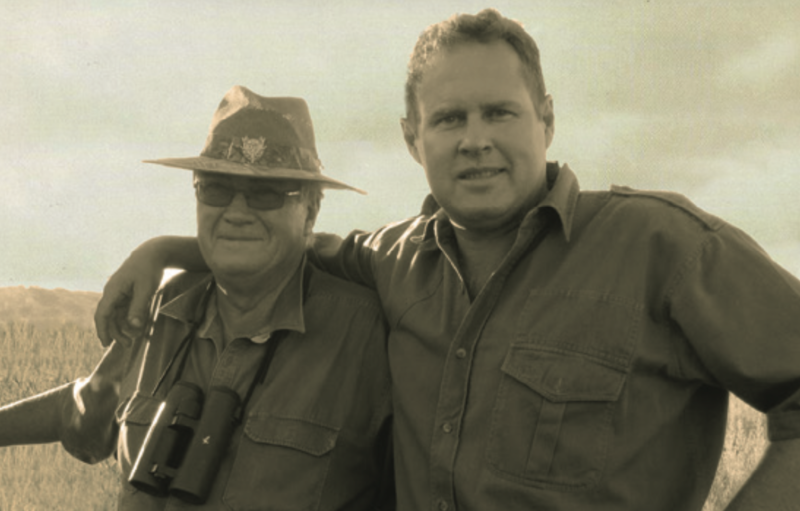 He guided photographic safaris in his early days and qualified as a professional hunter in the late 1980s. 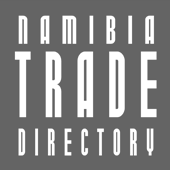 Mike established the Progress Safari Lodge 20 years ago on the 16,000 ha family ranch near the Hosea Kutako International Airport outside Windhoek in 1998 from where he conducts hunting and photographic safaris. Following in Mike’s footsteps and representing the fourth generation of hunters is Mike and Sonja’s son, Alec Frederick, in the photograph below. With the vast hunting experience and the African bush of his father, grandfather and great grandfather it is not surprising that Alec is following in Mike’s footsteps and was introduced to hunting at a very early age, firmly cementing the old school way of ethical hunting on foot with shooting sticks.